Because I wasn’t exactly clear on the function of the International Driving Permit, I was unsure of whether or not I needed to have one when we head to Italy. 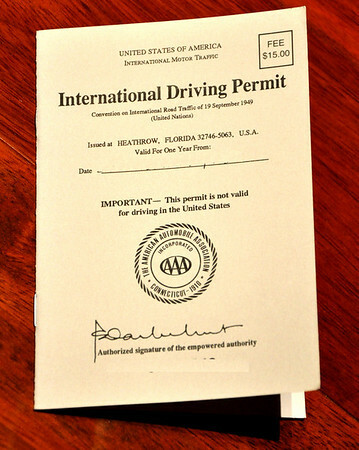 What is an International Driving Permit/License? It is a booklet that translates the type of American license you hold (ie. motorcycle, car, bus etc. ) into 10 different languages. It is to be carried along with your American license. Inside, it contains your name and birth date information, a passport-sized photo of you and your signature. Your IDP is valid for 1 year. An IDP does not give you “permission” to drive abroad. Your own United States license does this. It simply helps whomever needs to see your US license understand just what it is they are looking at and the type of vehicle you are permitted to operate. Many European car or motorcycle rental outfits will require that you have an IDP in order to use their services. Where do you get an International Driving Permit? There are 2 associations to get an IDP from: American Automobile Association and The National Automobile Club. I was able to walk in to my local AAA office and get an IDP on the spot. It was $15 plus a nominal fee for them to take 2 passport photos. The whole process took less than 15 minutes. If you do not have a local AAA office, you can order your IDP via mail, as well. 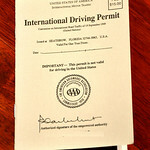 Do you “need” an International Driving Permit? You might be able to get by without it, but for less than $20 why take the risk and open yourself up to unnecessary hassle? Get one. Great information! I’d love to go to Italy. What part of the country are you planning to visit? Yay for you! I am jealous. We had such a great time there in June I SO wish I could go back. When are you going? Are you guys going it alone or with a tour? I can’t wait to read all about your trip here. We did not need an IDP but, like you said, why risk NOT having it if you need it. I loved reading about your trip on your blog, ToadMama. We’re going in September. We aren’t using a tour, we’re just winging it along with our dear friend Pimmie from Holland. He’s been through the passes and the area and speaks like 5 languages – so we’re in good hands! Now… which side of the road am I supposed to ride on?! Great little bit of info for traveling overseas. Thanks Fuzz and enjoy the trip! @Im really excited, P. Can’t wait to see you again! Fuzzy, I’m even more jealous now! Although I have to say though I am not typically a tour person, I’d do the Edelweiss thing again in a heartbeat. Having your own personal guide should be awesome. Stelvio was awesome, but it’s more of a technical ride than fun ride. The most fun ride for me was Jaufenpass (Passo de Monte Giovo). You can go much faster and at times are pretty much hanging off the side of the mountain. It was so much fun that when I got to the top, I literally tore off my helmet and yelled, “That was f’ing awesome!” Going up was far more fun than coming down, so make sure you go from the St. Leonhard side to the Sterzing/Vipiteno side (south to north I think). Our tour guide, who grew up near Innsbruck, told us that Jaufenpass is where the locals go when they really want to let loose. That part of Italy was once part of the Austrian state of Tirol and is still mostly German speaking, so most of the towns and passes have both German and Italian names. Try to visit Innsbruck if you can. It’s gorgeous! I’ve always heard good things about Edelweiss. I would consider doing one of their tours too. Having someone do the leg work for you must be nice. There is a lot to be said for that. Glad you got your IDP, we didn’t learn about them ’til the day before we were leaving for Tuscany and I freaked out! Luckily we didn’t need it, but it was pretty stressful thinking we would not be able to rent the car without it. You’ll have a great time! Make sure the country you’re visiting is on the list, though. Not all countries agree to the IDP. I get an IDP every summer when I visit the States, because the Koreans charge a fortune to take their motorcycle operator test, and you really have to bribe the tester to pass the first time around. They fail people regularly so as to make more money. So I get around it by hiding my Korean car driver license and using only my Michigan license and the IDP, since Korea is a signatory to the IDP agreements.